Bubble Bath : Unscrew the Dalek's head and pour the Dalek juice into your bath. Made in 1976. 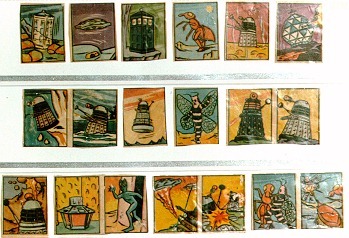 Wall's Ice Cream Cards : A small selection of a series of 36 with a story fragment on the back. Cadet Sweets Cards : Two cards from a series of 50 with a story fragment on the back. Made in the 60s. Ty-phoo Cards : A small selection of a series of 12. Made in 1976. Orange Flavor Chew : Made by Goodies in 1982. 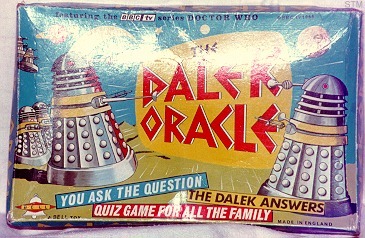 Dalek Oracle : Made by Bell Toys in 1965. 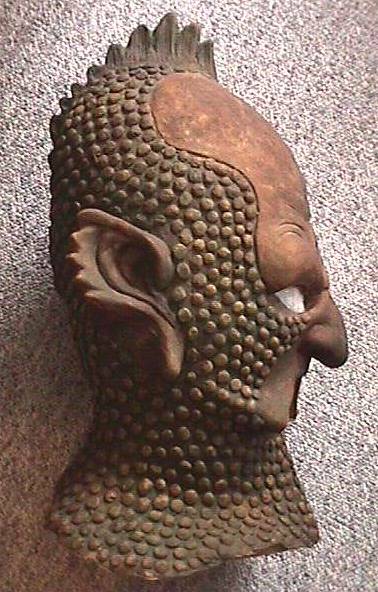 A question/answer toy. Sonic Screwdriver : Dubbed the "most accurate replica" of the sonic screwdriver ever made. Hand lathed aluminium sonic screwdriver. Baby Plate : Start your baby off right with a plate featuring an evil ruthless killer... Made in 1965 by J H Weatherby & Sons. 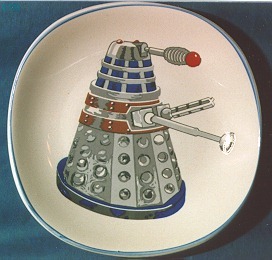 Troughton Plate : Made by Royal Albert. 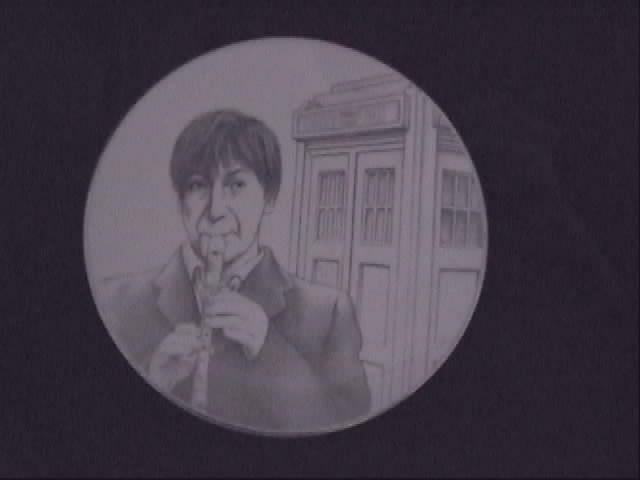 Image is a black outline of Patrick set against the Tardis on white porcelain bone china. Finished with silver trim. About 21cm. 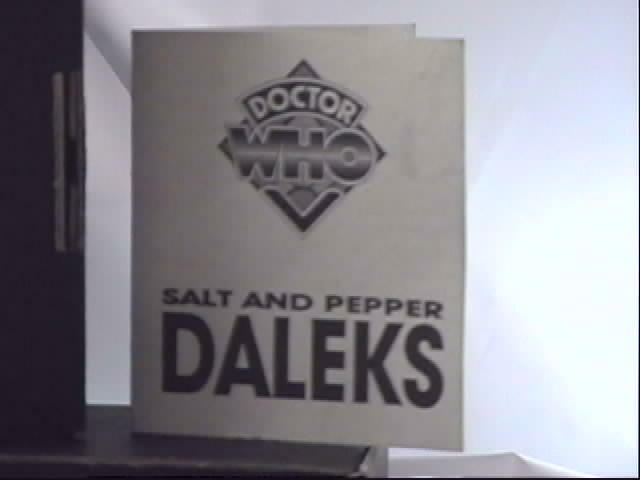 Other plates released in that year include Doctors 1,2,3, Master (Roger Delgado), Davros with Daleks. Made in 1985. 2Here's a picture of the plate with the box. Water Transfers : Wet them and hold them to your skin to transfer the ink. They were made in 1965 and are quite rare since they were typically used. They were made by S. Guiterman. 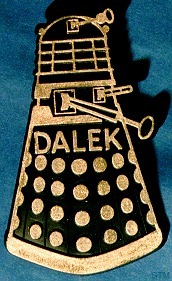 Dalek Pin : This rare pin was made by Plastoid in 1965. 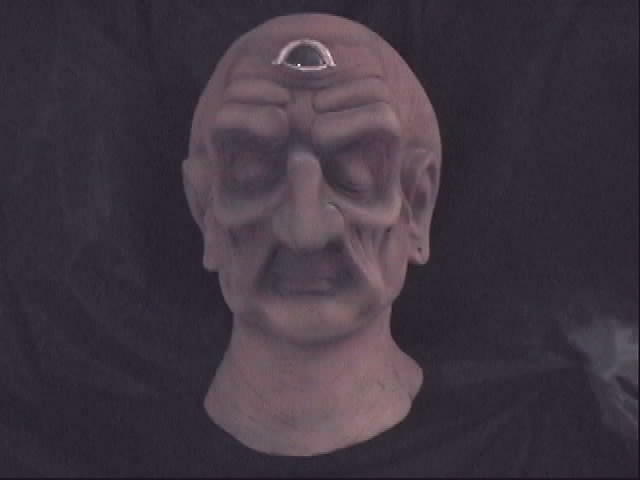 Davros Head : Made by BBC Enterprises 1987 Said to be from the original BBC mold. 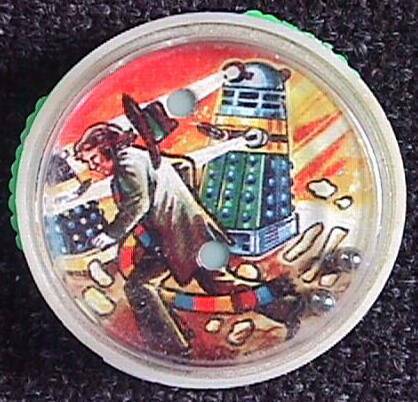 Dalek Ride : Made by Edwin Hall in 1967. Note the openings so the kids can see out. 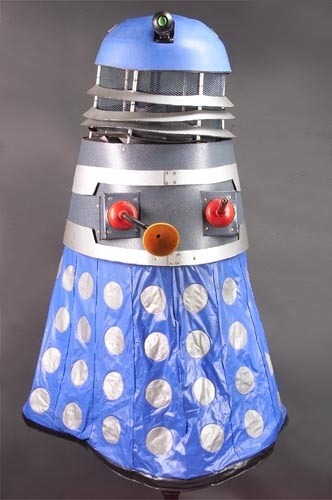 Dalek Playsuit : Made by Scorpion Automotives in 1964. It doesn't look quite as solid as the ones on TV. Cyber Props : This head, chest and gun are actual props used in the show. 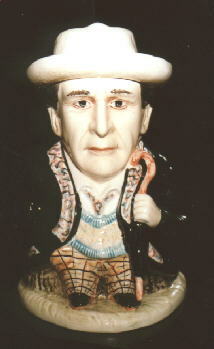 The head and chest are painted fiberglass. 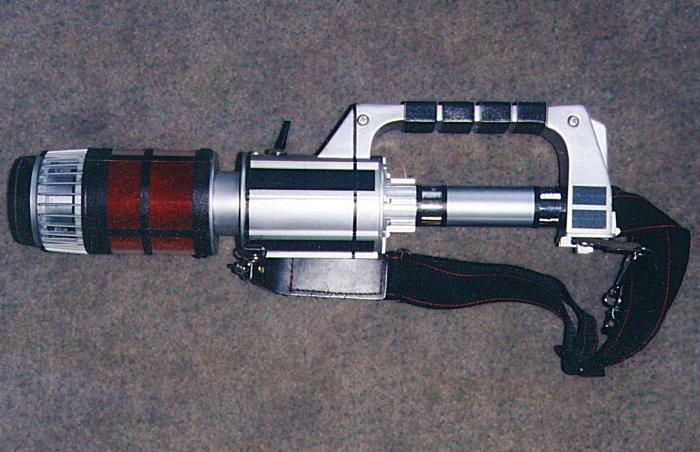 The gun is made from a variety of materials including wood and mylar. 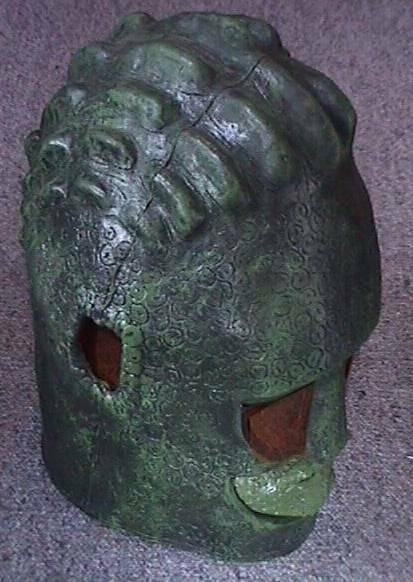 If you wear it for awhile, you'll probably decide that the actors who play Doctor Who monsters don't get paid enough. Cybermen props : Actual props used in the show. 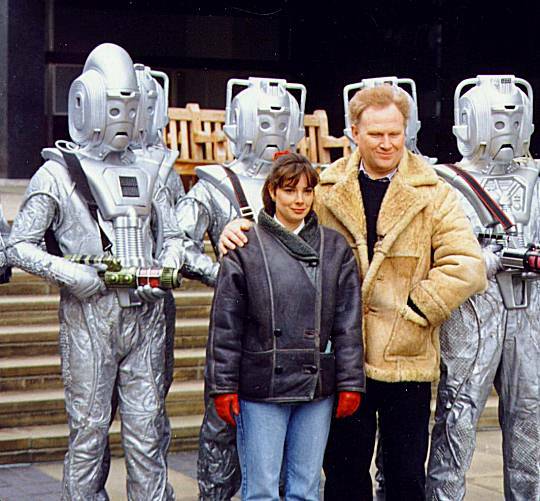 Steve Gostelow made props for the BBC and he is wearing the Cyberman Controller outfit in this picture. 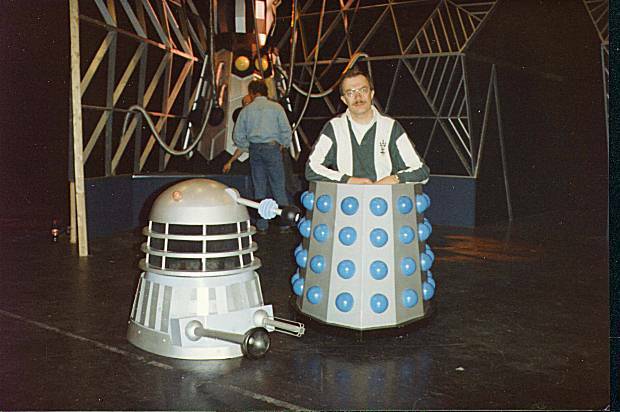 Dalek Props : Steve Gostelow on the set and dressed as a Dalek. Cyberman Gun : A close up on a Cyberman gun prop. 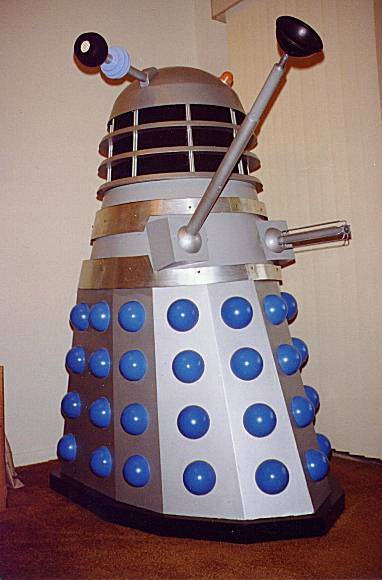 Dalek Prop : Actual BBC prop. This is a '60s version with mesh and slats added. 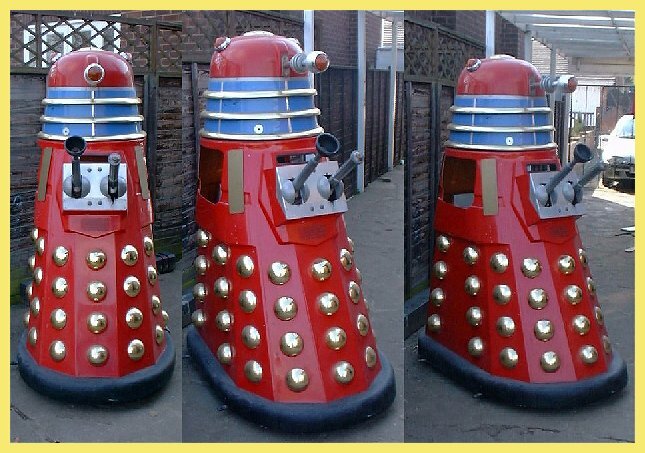 This Dalek is now in retirement in the U.S.
Draconian Head : Actual BBC prop. 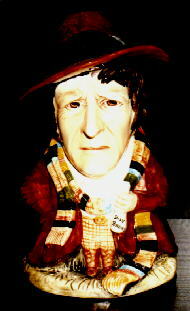 Used in the third Doctor story "The Frontier In Space". Made by John Freidlander at the BBC in latex rubber. 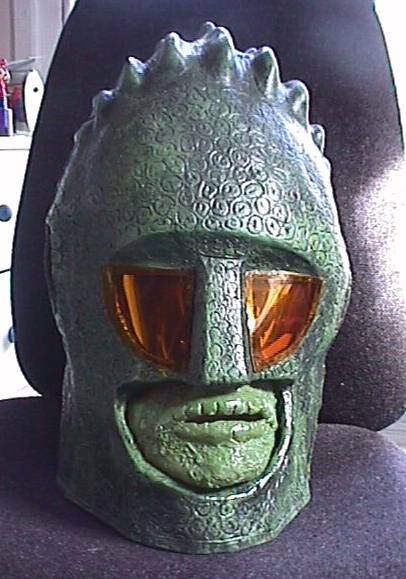 John Pertwee's favourite alien/monster. Here's a side view. 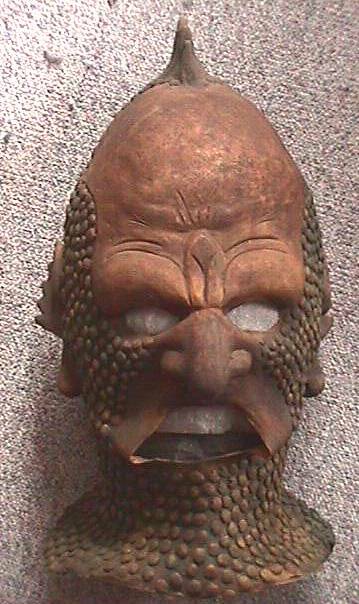 Ice Warrior Head : Probably an actual BBC prop. Here's a side view. Animation Cel : A prototype cel from Nelvana for a series that was never made. It's from around 1990. 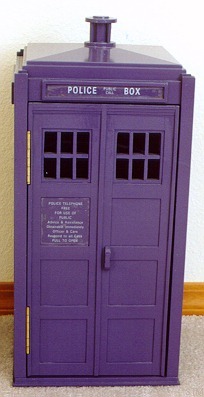 TARDIS Phone : This heavy wooden TARDIS is 17" tall and houses a wall-mountable phone. I almost forgot to photograph this because "it's just the phone!". Fortunately for those of us outside the U.K., the phone supplied is easily removed and replaced by one of the local variety. 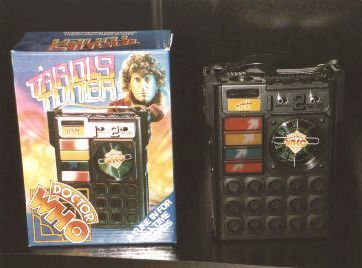 TARDIS Tuner : A radio designed to look like it might be found in the TARDIS though there was never such a radio used on the television show. Made by Shortman Trading in 1976. 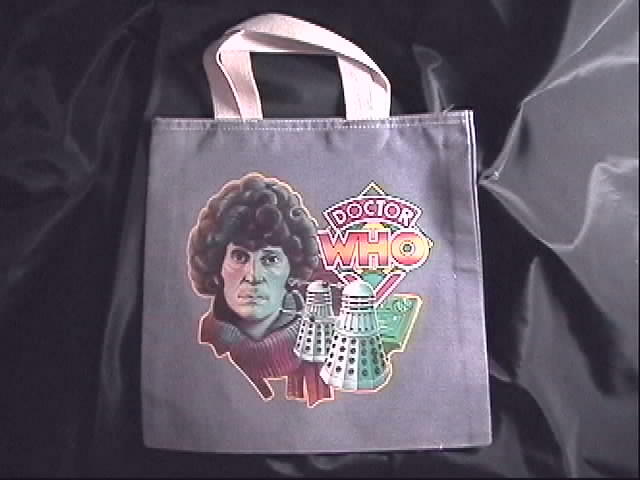 Tote bag : Manufacturer unknown. Hartnell Tankard : Made by Lustleigh Pottery in 1992. Limited to 750 sets. The entire set sold for about £450. 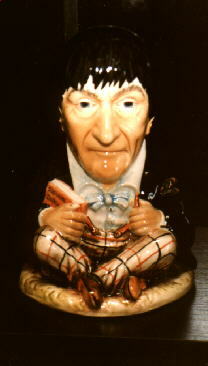 Troughton Tankard : Made by Lustleigh Pottery in 1992. Limited to 750 sets. The entire set sold for about £450. 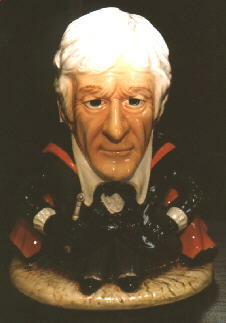 Pertwee Tankard : Made by Lustleigh Pottery in 1992. Limited to 750 sets. The entire set sold for about £450. 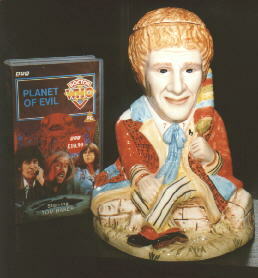 Tom Baker Tankard : Made by Lustleigh Pottery in 1992. Limited to 750 sets. The entire set sold for about £450. Davison Tankard : Made by Lustleigh Pottery in 1992. Limited to 750 sets. The entire set sold for about £450. 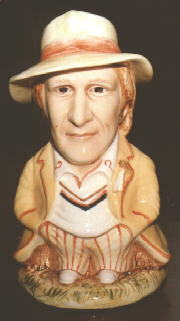 Colin Baker Tankard : Made by Lustleigh Pottery in 1992. Limited to 750 sets. The entire set sold for about £450. McCoy Tankard : Made by Lustleigh Pottery in 1992. Limited to 750 sets. The entire set sold for about £450. 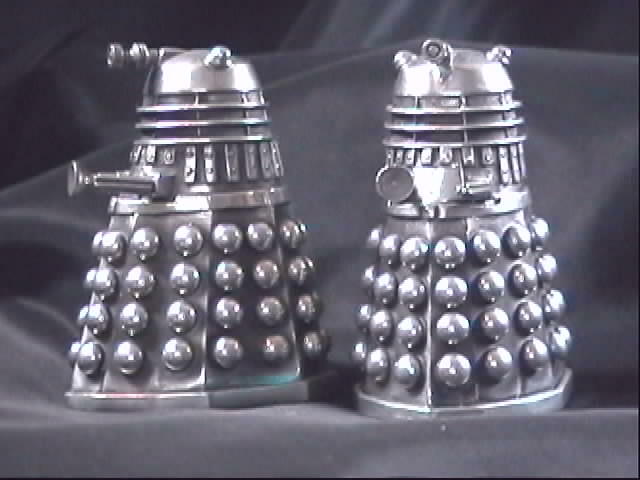 Dalek Salt Shakers : 100% hand finished pewter Dalek salt and pepper shakers. 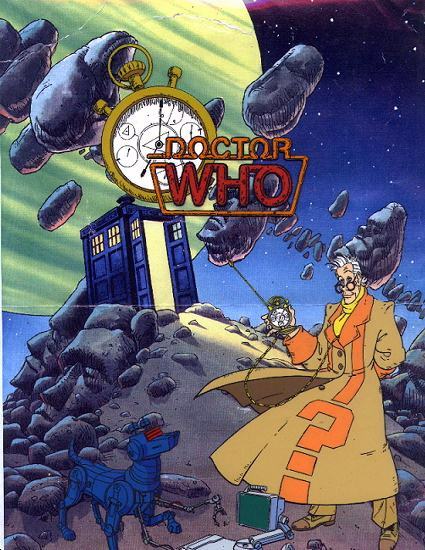 Made by Asmortartz Productions in New Zealand, circa 1993. Sold for 85 pounds. Here's a picture of the card that came with them. 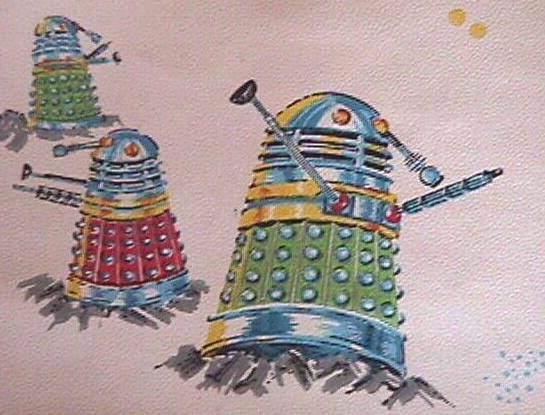 Dalek Birthday Card : Made in 1965 by Newton and Mills. 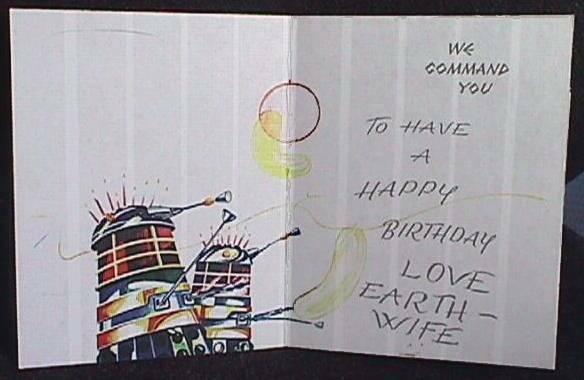 This example was sent from an Earth man to his Earth Wife. Here's an inside view. 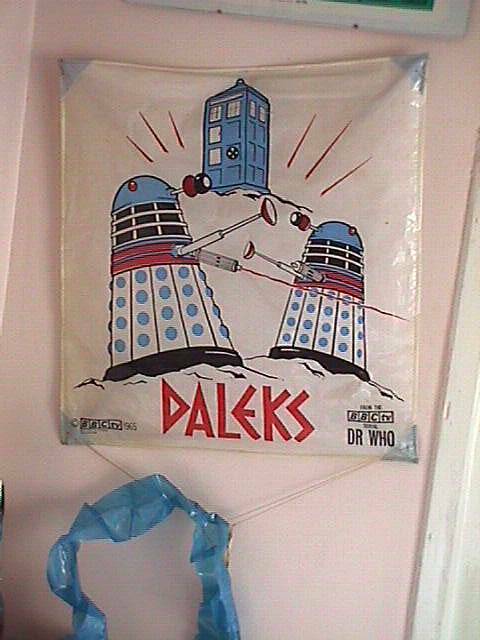 Dalek Kite : Made by Bowman Jenkins in 1965. A very flimsy item hence few survive today. Produced in thin polythene with wooden struts. Nice artwork. 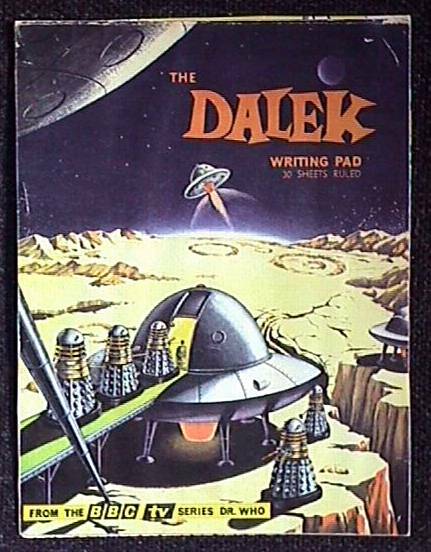 Dalek Note Pad : Made by Newton Mills Ltd. in 1965. 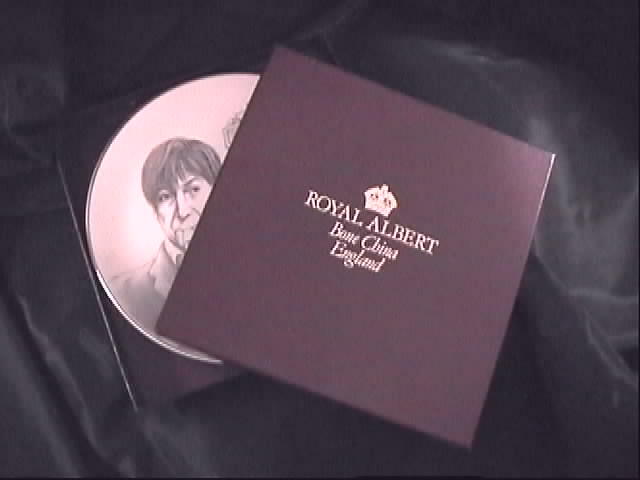 Plain interior with great artwork on front cover. Around 5" by 7" in size. Can Daleks write?? 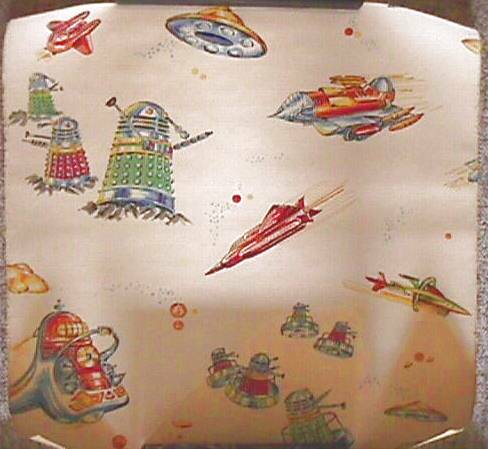 Dalek Wallpaper : Produced from 1965 to 1967 by The Wallpaper Manufacturers Ltd., a division of Crown Wallpapers. 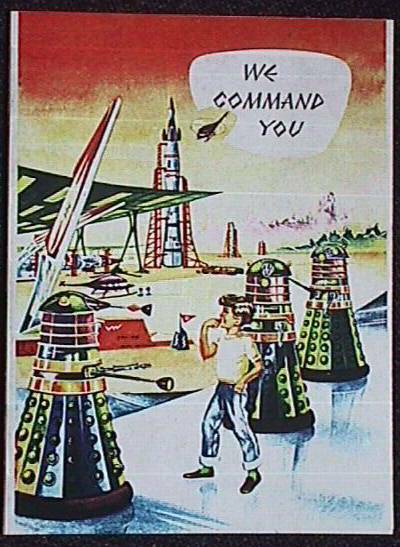 This was a very popular Dalek item in the 60's but most examples are now either covered, stripped or shredded. Artwork for the craft and Daleks based very closely on that used for the 1st Dalek annual. Here's a close up view. 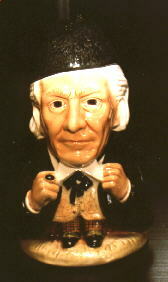 Dr Who Pencil Sharpener : This is one of 4 produced with ball-puzzles on the top showing the 4th Doctor. Made in 1979 by H. C. Ford.